It is time for you to vote for Samuel in the first round of the 1st ever Aperiodical.com Big Internet Math Off! In the first round Samuel is facing off against Paul Taylor, and they need y’all’s help to win. Head over to the match page and vote for Samuel so they can tell y’all about what an Irish bridge, graffiti, and the letters i, j, and k have to do with getting to the moon in the second round. For their first round entry Samuel shares with you the story of why your, well not you wise, beautiful listener but definitely for everyone you know, their friends have more friends than they do and how this paradox can help fight epidemics. 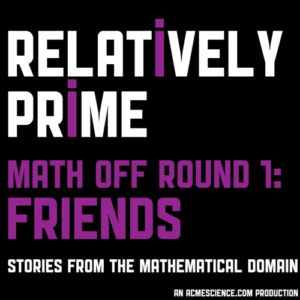 If after listening you want to find out more about why your friends have more friends than you do you can read Scott’s paper and check out Nicholas’s work or you can listen below to the season one RelPrime episode a longer version of this story was in. Samuel also wrote an expository piece about the friendship paradox for Second-Rate minds you might want to check out.